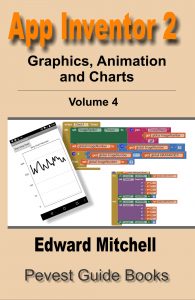 Please start with “Part 1: Basic Bluetooth communications using App Inventor” to learn how to configure, set up and program an App Inventor app that communicates over Bluetooth between two Android devices. 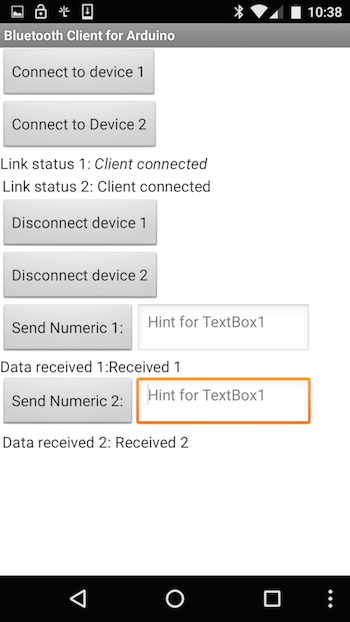 Then, read “How to connect App Inventor apps to Arduino using Bluetooth” before going through this tutorial! Then continue with this tutorial. This tutorial shows how an App Inventor app can communicate with 2 (or more) Arduino boards and Bluetooth devices simultaneously. 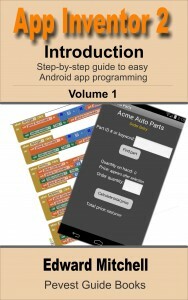 These instructions assume you are familiar with the code and hardware presented in Part 1 and Part 2 and “How to connect App Inventor apps to Arduino using Bluetooth“. 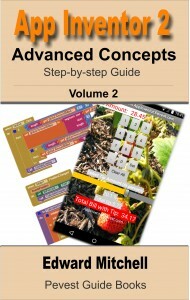 This tutorial uses the same Arduino source code as in that tutorial. A follow up tutorial will show how to simplify some of this code for supporting multiple Bluetooth devices. Bluetooth is a short range, low power, limited speed wireless communications technology. 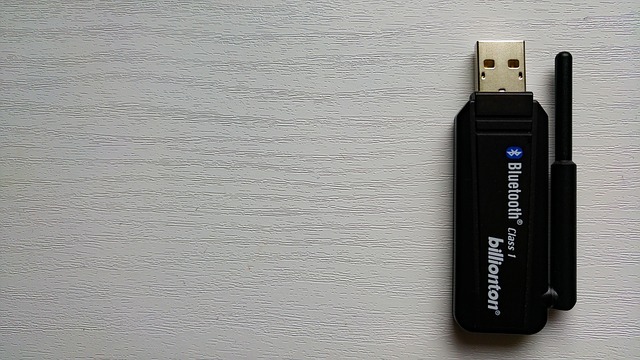 The original Bluetooth technology provided a serial communications link between two paired devices (as compared to an individual data packet sent between up to n devices using the much newer Bluetooth LE – see here and here for information on Bluetooth LE). Arduino is a microcontroller board for building hardware projects. You can write software for Arduino using a programming language similar to the C++ programming language. 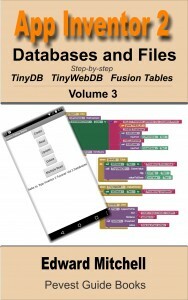 The code used in these examples has been tested with some specific Bluetooth modules connected to Arduino. These include the JY-MCU (Amazon (Prime), Amazon (non-Prime) and also some HC-05 and HC-06 based Bluetooth modules. Build two Arduino boards each with an appropriate Bluetooth module as described in the prior tutorial. Compile and load the Arduino software in to each of the Arduino boards. Test and confirm that your basic LED lights flash for the original, single Bluetooth connection case. Then, with two working boards, continue to this tutorial. Before running this app, be sure to use Android | Settings | Bluetooth to “pair” your Bluetooth devices with Android. Then, run the app and select Connect to Device 1. This displays a list of available Bluetooth devices in the vicinity. Select your specific Bluetooth device for the connection. Do this for both Bluetooth devices. 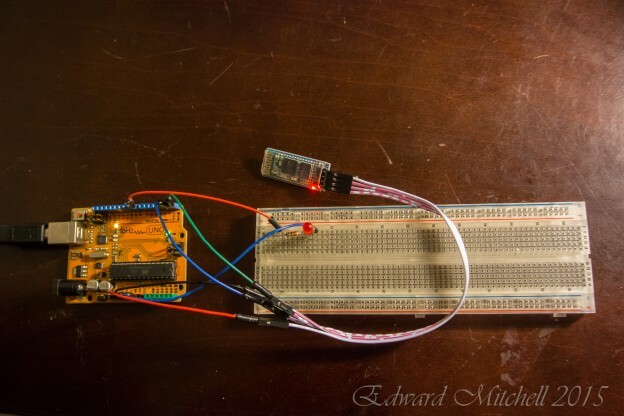 Once connected, you can send some simple commands to the Arduino board. Commands are very simple – a single number – to tell the Arduino to do something (this confirms that the Bluetooth link is working). If we enter a single digit 1 and then press Send Numeric 1, the Arduino board will send back 2 bytes of data which will then be displayed on the app screen. If we enter a single digit 4 and then press Send Numeric 1, a value of 4 is transmitted over Bluetooth to the Arduino board, which responds by flashing the externally connected LED. 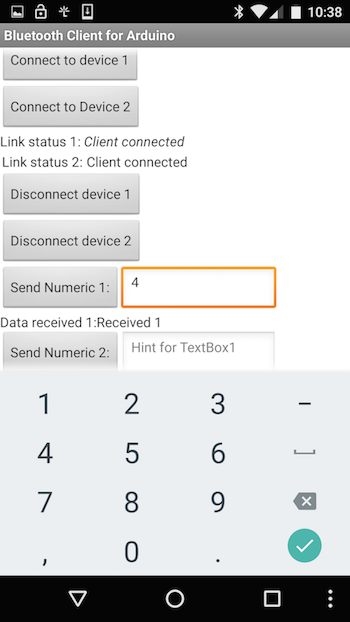 Because the text box for data entry has its property set to NumbersOnly, a pop up numeric keypad displays when entering data, rather than the usual Android text keyboard. I created a short video showing this app in operation. There are two versions of the video – one is standard 2D format and the other is in VR 3D format for viewing on Google Cardboard-like viewers used with smart phones to watch VR videos. That version is in 3D, for viewing with VR 3D viewers or 3D TVs or monitors.